Last year, we saw a number of disorders in sunflower that were mainly related to a heat stress by parental line interaction. Despite extensive testing by the USDA and UC ANR for pathogens in many affected sunflower plants, no causal agents were found. 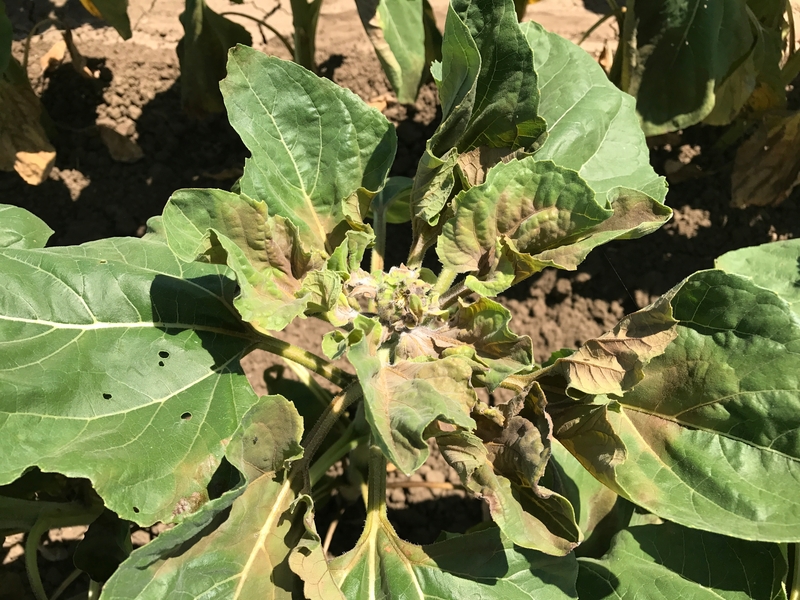 Overall, symptoms were found only on the female lines and were fairly uniform in plants in the heat-stress affected fields, which is another clue that the cause was abiotic or environmental, not due to a disease problem. A disease would be more random and affect both male and female lines (unless one line has resistance to the disease). 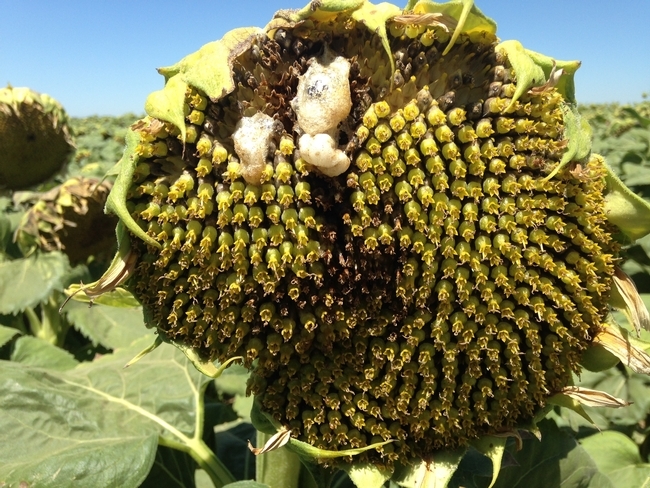 One disorder observed was foamy head rot of sunflower, a malady that produces copious white frothy material that exudes from the leaf petioles, main stem, and flower heads, causing yield and quality losses. There were no obvious wounds, though insects, such as stink bugs and ants, were attracted to the sweet, alcoholic smelling frothy sap. This condition usually occured during hot, dry spells with ample soil moisture present. Possibly, excessive heat caused splitting or micro-wounds that allowed the ingress of organisms which otherwise would not be harmful, much like Rhizopus head rot (a fungus) following insect or bird damage to flower heads. This disorder has only been observed in the female lines, indicating that certain specific genetics predispose sunflowers to this problem. We observed this malady in the same female parent lines in 1993 and 2014, where it was fairly uniformly distributed in fields. Similar symptoms were found in some female plants in 2017 (likely a different parent line as the symptoms were not as widespread as in previous years). Another disorder we observed last year was where flower buds turned brown and did not develop or only partially opened with some seed set, or the fully open sunflower heads were scalded. This injury occurred after an excessive heat wave last June (100F to 106F for 8 consecutive days). Again, the damage was only observed in the female lines (not the males). In addition, some female lines at the same stage weathered the heat wave, indicating differences in parental line susceptibility. There was some indication that heat injury to sunflowers was worse where there were gravel streaks in the fields (holding less moisture). 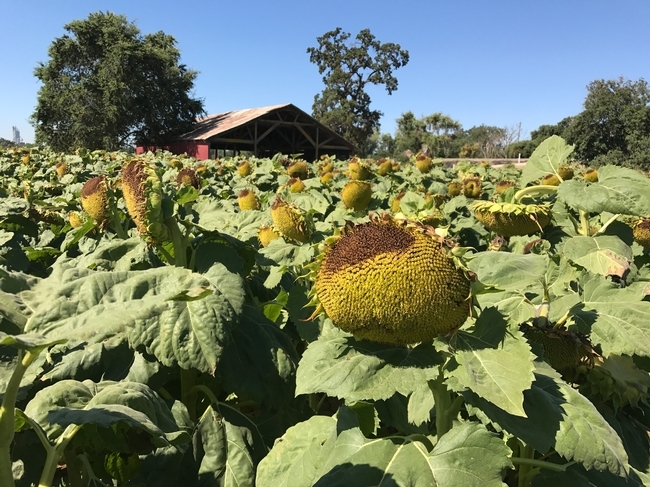 This suggests that it's critical to be prepared with good irrigation management practices before heat waves hit to ensure sunflowers have adequate water during hot periods. In other fields observed last summer, the female sunflowers set seed (hull present), but the seed did not fill (no kernel) due to poor pollination from a lack of honey bee activity due to excessive heat. Another malady observed was where the sunflower heads did not drop after pollination, resulting in sunburn and high seed predation by birds, which is entirely varietal and physiological. Let's hope that we have favorable growing conditions for hybrid sunflower seed production this coming year. Watch for predicted heat waves and be prepared with good soil moisture going into them, especially in the early bloom stages.